Disability discrimination is when an employee is treated unfairly or put at a disadvantage for any reason relating to their disability. This could happen on a regular basis or as a single one-off act of discrimination. There are six key areas of disability discrimination; direct discrimination, indirect discrimination, harassment, victimisation, discrimination rising from disability and failure to carry out reasonable adjustments. All employees are covered by the regulations outlined in the Equality Act 2010. Disability discrimination covers all employees including management, contract or agency workers, freelancers, self-employed staff, trainees, apprentices and also job applicants. Employees are covered within all areas of employment, training and recruitment. The Equality Act 2010 sets guidelines about what is classed as a disability and what types of acts are classed as discriminating behaviour towards an employee. The act states that a disability is a mental or physical impairment that has a substantial or long-term effect on your ability to perform normal day-to-day activities. A ‘substantial effect’ is classed as being greater than minor or trivial but may fluctuate over time. A substantial effect might also not be present all of the time. ‘Long-term’ accounts for any condition that lasts or may last in excess of 1 year (12 months). ‘Day-to-day activities’ are types of common actions non-disabled people carry out without any special attention; acts such as reading and writing, using a computer, following a timetable, sitting down, standing up, driving a vehicle, lifting, basic physical activities, etc. In the areas of discrimination against disability progressive conditions and illnesses such as HIV, cancer or multiple sclerosis are also covered by the act. Exceptions to illnesses classed as a disability cover addictions to alcohol, nicotine or other substance abuse, unless this addiction is the result of medically prescribed drugs or treatment. The laws of the Equality Act also cover you if you have had a disability in your past. If you had a physical or mental health condition that lasted for over 12 months that you recovered from you are still protected from any discriminatory behaviour relating to that disability. The act states that you must not be discriminated against because you have a disability, that someone assumes you have a disability (perceived discrimination or discrimination by perception), or you are connected to somebody who has a disability (associated discrimination or discrimination by association). It is not considered unlawful discrimination when treating a disabled person more favourably than person who isn’t disabled. Direct discrimination is when an employee is treated unfairly because of their disability when compared with someone without their disability. This could include situations such as despite being the best qualified or experienced for a role they are overlooked because of their disability. You may also be discriminated against if your employer treats you unfairly because you care for a disabled child, parent or other family member. Direct discrimination can take place at any time of employment and before. Discrimination during training courses and exercises are liable for claims and also while applying for employment or during the interview process. Being asked health questions on application or at interview are seen as a means to screen out disabled applicants maybe considered discriminatory unless they are directly related to the employment role. 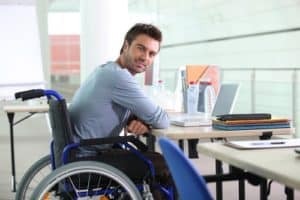 Indirect discrimination happens when any rules or regulation set out by the employer’s company appear to put disabled employees at a disadvantage. Examples of indirect discrimination can include unjustifiably applying time deadlines for meetings or location specific objectives that could impact employees mobility or physical impairments. Harassment occurs when a disabled employee is treated in such a way to make them feel humiliated, offended or degraded. Any act considered a violation of an employee’s dignity, or in creating an intimidating, hostile, degrading, humiliating or offensive environment to work in is classed as harassment and is liable under disability discrimination laws. Harassment includes making negative remarks including bullying, mockery, making jokes or name-calling in regard to an employee’s disability. Harassment also includes unwelcome discussion of the impact of the employee’s disability, refusing to work with a disabled employee, or excluding disabled workers from training, meetings, social events or other gatherings. The Equality Act also covers third party harassment. This states that an employer is liable to behaviour directed towards disabled workers by those associated with the business. This can include clients and customers, delivery operatives, trainers, suppliers, patients or other people in direct contact with the business. An employer should be seen to take appropriate steps to prevent third party harassment or rectify problems that occur to the satisfaction of the employee. If third party harassment has happened previously on two separate occasions it will be considered that the employer hasn’t carried out appropriate steps to prevent harassment and may be liable for his actions. Victimisation is the act of receiving detrimental treatment as a result of having made a complaint about disability discrimination or helping a colleague to make a complaint of the same. It is also classed as victimisation if an employee is treated detrimentally because an employer, manager or other member of staff believe or assume that an employee has made a complaint of disability discrimination or has assisted another member of staff in doing the same. The Equality Act also covers discrimination which occurs if an employee is treated unfavourably because of something arising from their disability. Examples of these matters could include not making accommodations for a guide dog or disallowing performance bonuses due to an employee’s time off for on-going medical treatment without sufficient justification. An employer is expected to carry out reasonable adjustments in order for workers with disabilities to be able to access and perform their roles, education or services as easily as non-disabled workers. This may include parking priorities, access facilities, seating arrangements and a range of similar accommodations. A reasonable adjustment is dependent on various factors and must also show consideration to the amount of resources available to the employer. If an employee feels that they have been discriminated against because of their disability they should seek to find a solution by means of the appropriate channels set out by the business. Making a complaint to a manager about the behaviour in question should be the first step. If no suitable resolve is made the next step is to make a written complaint to the employer. A written complaint is record of the discrimination if the issue is eventually taken to a tribunal. If there is still no suitable outcome then you are entitled to raise a tribunal against your employer and any colleague who may have discriminated against you. A tribunal may only be brought against your employer if you have followed the ACAS Early Conciliation process. A claim must be made within 30 days of the discrimination or the most recent act of discrimination. If successful a tribunal will announce the rights of the claimant, they can recommend the employer implements key changes to their processes to avoid further issues and similar cases arising, and also award compensation to the victim. Awards to injury and feelings include hurt feelings, aggravated damages and injury to health. The Court of Appeal has implemented guide bands to the amounts of the compensation awarded. These range between £800 for less serious cases to over £40,000 for the most serious. Awards will also cover loss of earnings, additional losses and money lost from interest charges. We have specialist solicitors who will guide you through the best action to take in your unique situation.